Josh Tickell and Rebecca Harrell-Tickell uncovering the truth about the oil spill in the Gulf. Disclaimer: I am a huge fan of Josh Tickell and Rebecca Harrell-Tickell, the dynamic duo behind the Sundance Award winning documentary, "FUEL". I met them when they drove cross country from California in a green vehicle caravan and arrived to premiere "FUEL" in NYC. Josh and Rebecca are also the producers - directors of an astonishing new film, "The Big Fix". They weave together beautiful, haunting imagery of the Gulf coast. There are spot-on interviews with a diverse assortment of people and plenty of helpful, historical information - all the while uncovering the dirty truth about the BP oil spill. The BP Deepwater Horizon rig exploded on April 20, 2010. Most of us thought the spill was "cleaned up" and the problem "went away". Unfortunately, to a large extent, the entire event has been supplanted in the media/mass consciousness by other major news stories and events from around the world. After watching "The Big Fix", it is hard to conclude that things are so rosy down in the Gulf. In fact, the bottom line message from this well-documented film is that the BP oil spill in the Gulf never really went away. And, in fact, the oil is still spilling into the Gulf. Not to mention, the absolutely horrific fact is that the chemical dispersant, Corexit, which was and is still being used in the Gulf to "clean up" the oil, is an extremely toxic substance. 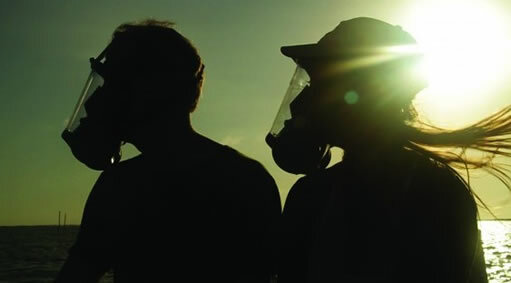 The film reports that Corexit is wreaking havoc on the health of the people and marine life in the Gulf. It's the kind of "this can't be true" fact that is so terrible, you don't want to believe it, but must. Film Poster for the Josh Tickell - Rebecca Harrell-Tickell film, "FUEL", which won the Sundance Award for best Documentary in 2008. When you see and hear how the the Gulf residents captured in "The Big Fix" have been affected by Corexit and the spill which keeps on spilling, beware, it is both heart wrenching and frightening. When you see and hear Gulf residents driven to tears by this environmental tragedy, you want to cry with them. Rebecca Harrell, herself, was seriously sickened by Corexit during their filming in the Gulf. It is, literally, sickening to watch this toxic crime covered up. And, when you listen to Marine/Eco-Activist, Jean-Michel Cousteau, son of champion of the seas, Jacques-Yves Cousteau, state so emotionally, "We're being lied to", you realize that the "cover up" depicted in the film is not the rant of uninformed "trouble maker activists", but a real cover up. We all need to unify our voices and join Rebecca and Josh and say - Enough is Enough. Watch this video from Jean-Michel Cousteau's Ocean Futures Society which investigated the BP Oil Spill one year after it occurred. When Josh and Rebecca emailed to tell me they were opening the film in NYC at the AMC 7 in the East Village and wanted to create "7 Nights of Awareness" in the theater, post-screening, I immediately jumped on board to help build the events and gather as many people and groups in NYC together to see this watershed film. Our purpose for the "7 Nights of Awareness" is, yes, to divulge the truth about what is going on in the Gulf, in addition to stimulating a dialog that will foster positive action and create solutions which will help our planet become less dependent on fossil fuels, more healthy and truly sustainable. Despite the negative events depicted in the film, the filmmakers make a point to highlight, towards the end of the film, an endearing bayou local. He wears a yellow t-shirt and dons a Mardi Gras-like necklace across his tanned neck while installing solar panels on the metal roof of his modest home. Josh Tickell narrates at the end. He urges the audience to "unite and take a stand" and deal with the truth and get on with implementing clean energy solutions that are at hand. Tickell concludes, powerfully, asking: "In a struggle for true justice and a better world, where do you stand?" Being solution-based, Josh and Rebecca, currently, have an additional film out, FREEDOM, which focuses on sustainable and renewable energy options already available which will enable us to be free from the use of oil and other sources of not-clean energy. To date, the inspiring and passionate people and groups that have come on board for the "7 Nights of Awareness" include: NYC-based Fabien Cousteau (grandson of Jacques and son of Jean-Michel Cousteau) and founder of Plant A Fish; Rocky Kistner from the NRDC; Stefanie Spear and the new web site/newswire EcoWatch; Justin Bloom and colleagues from Waterkeeper Alliance; Dan Miner, founder of Beyond Oil NYC; New Orleans native and NYC-based architect, Drew Lang; Paul Mankiewicz, The Gaia Institute; Margaret Lydecker, Green Drinks NYC and Denise Katzman, EcoEdifier™ and Anti-Fracking activist; Stephen Del Percio, GreenBuildings NYC and Peter Fleischer of Empire State Future. Any one interested in knowing more about this important film and the events we are organizing in NYC, please contact me asap to discuss. A full press release will be sent out in the next few weeks with additional details. Please save the dates of December 2nd to December 8th and tell as many people as you can to come to the December 2nd - 8th AMC 7 screenings of "The Big Fix" and meet the inspiring Josh Tickell and Rebecca Harrell Tickell and the passionate NYC people mentioned above - all of whom are making a difference and helping to transform The Big Green Apple into being even more ecologically sound and resilient. Check out the trailer to "The Big Fix" below.